the pink toque. a craft blog: Sew Buttons! Today I decided to set the needles aside and do a little much-needed sewing. I pulled the sewing machine from the depths of the cold, dark basement and dusted it off. I had forgotten how much I love my sewing machine... it had been too long! Not only did I have an order to complete, but I also had been wanting to make myself a new winter-appropriate purse. 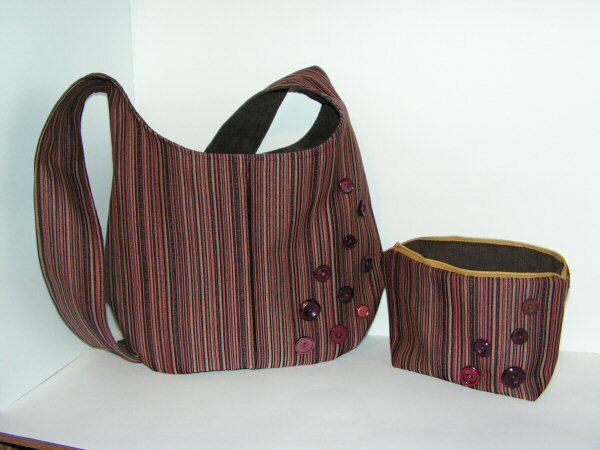 The purse is a new design that came to me a few weeks ago -- I'd wanted something more roundish, but I really like my hobo-style Brooks bag, so I combined what I liked about those two ideas and came up with a great stripey bag and matching pouch. Lucas and I went into Fabricland yesterday and rummaged through the "Buy 1 Get 3 Free" bin and came out with some winners -- namely the yummy striped fabric I used for the outside, and the luscious brown corduroy I used for the liner. They paired together really well, and I dug around in my button stash to find a few that matched to spice up the front. I really love it. The new purse is just in time to accompany me to the Calgary Festival of Crafts, which is in town this weekend. The girls and I are going out tomorrow and plan to spend the day there. It's only $5 to get in, and there's over 200 booths to browse... plus I'll be there with Michelle, Claire, Kerstin and Megan... what's better than friends and crafts? I hope to get some good ideas for next year's Christmas gifts and perhaps pick up a thing or to for my grandparents while I'm there tomorrow. Should be fun! 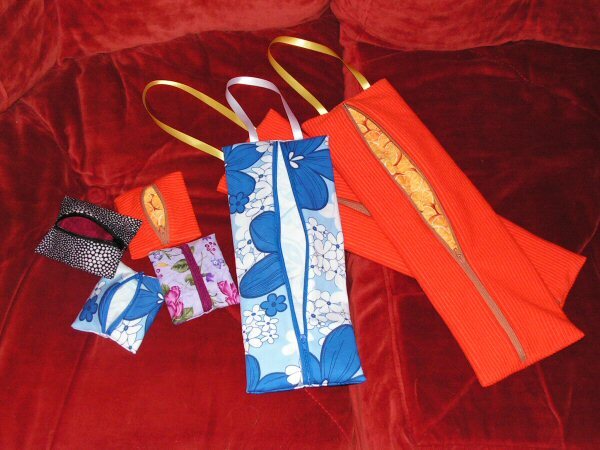 Also completed today is an order for Susie -- some pouches and bags to carry domino holders. They're colorful and fun to make! 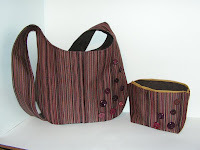 I got into a groove and got them all done this afternoon along with the purse. I feel really productive today! I should probably switch gears to work on handmade Christmas cards, but I kinda want to knit a few more of the tiny toque Christmas ornaments I'm making, too. My list is slowly dwindling down -- there is a light at the end of the crafting tunnel! I shouldn't have any troubles getting all of the gift items done before our trip to Indy in a few weeks, but cross your fingers!